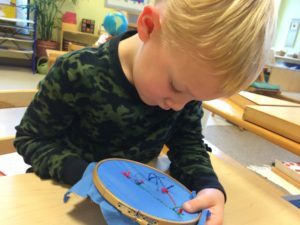 A Montessori education differs from a traditional daycare in many ways. One of the most important elements of a Montessori curriculum is the use of practical life activities. These activities are things that we do in our daily lives, such as cleaning, sewing, and gardening. 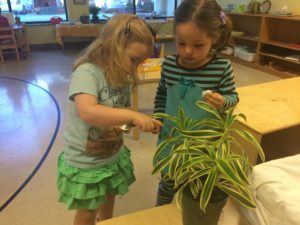 Practical life activities serve many different purposes in a Montessori preschool and you typically won’t find these in your average daycare. Practical life activities help children develop concentration skills, as well as control and coordination of movement. Tasks as simple as serving a drink to someone enhance multiple skills. 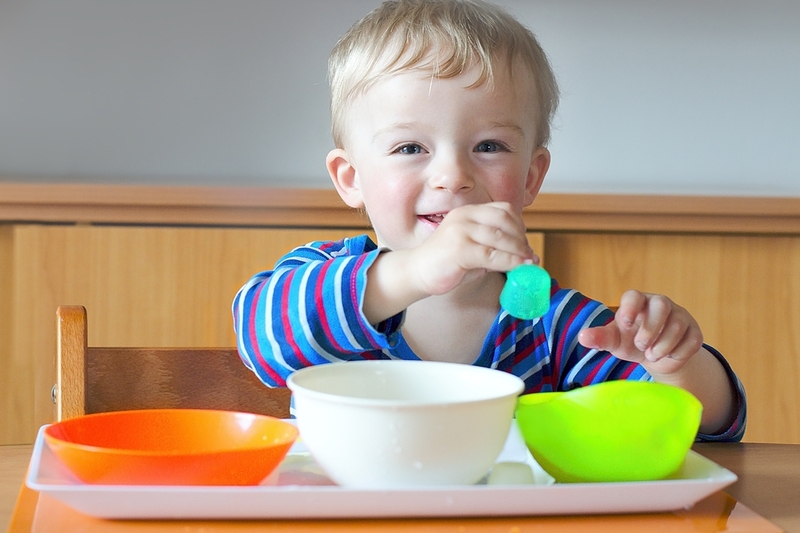 When a child pours water from a pitcher into a glass, several things are occurring. First, the child is developing fine motor skills in the hands, fingers and wrist from the pouring motion that is happening. Hand-eye coordination is also used as the child guides the pitcher towards the empty glass. 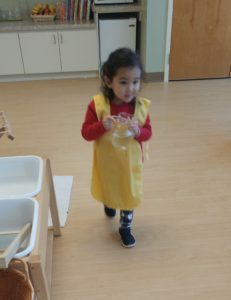 Finally, the child is using concentration skills to make sure that the water is not spilling or overflowing out of the glass. Children see adults as role models and imitate adult behavior. When a child has the opportunity to complete “an adult task,” they feel important and gain a sense of pride. They develop confidence in their abilities and a sense of independence. 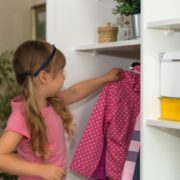 Being able to meaningfully contribute to the home by sweeping kitchen floors or sewing a button back onto a shirt helps a child feel more positive about himself, self-sufficient – fulfilling their drive toward functional independence. 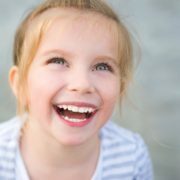 This sense of purpose and improved self-esteem only increases as a child learns to master more challenging tasks. As adults, we look at daily activities such as washing dishes and folding clothing as boring chores that are necessary in order to keep a clean home. 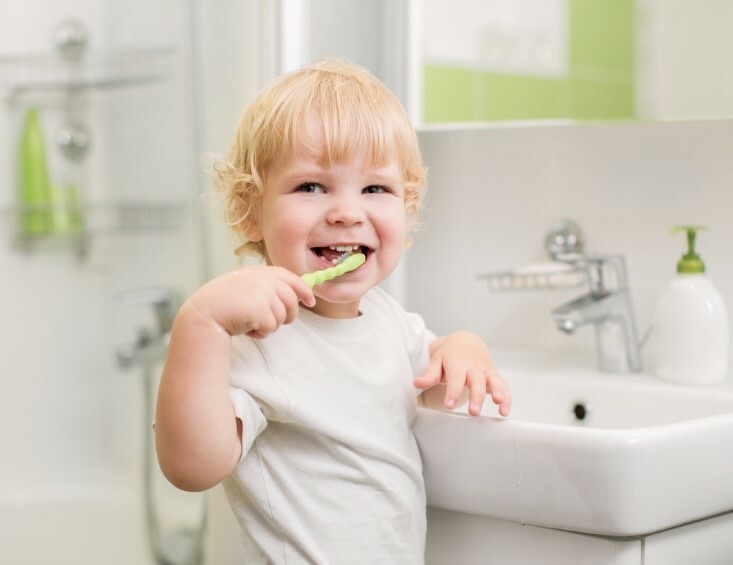 For children, however, these chores are interesting activities that adults do every day. 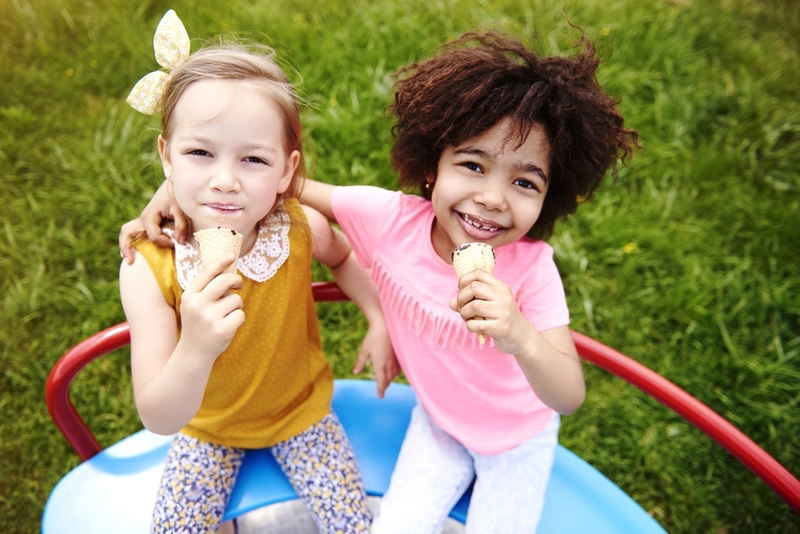 When you take the time to teach your child how to do these simple activities, you are showing them that you trust them and see them as a contributing member of the family. Practical life activities prepare children for the real world by teaching and refining individual skills to be carried out in purposeful activities becoming productive members in society. 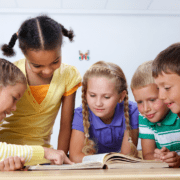 While traditional schools and education tend to focus solely on developing reading and mathematical skills, Montessori schools believe that reality-based skills set the foundation for academic skills, and should be taught as well. A good Montessori school will use authentic materials in the learning environment. For example, shoes should be cleaned with real polish, and water should be poured into a real glass. While materials should be real, it is best to use materials that are proportionate to the child. If a child is watering a plant, the handle must fit her hand and she must be able to easily carry the watering can. A child would not be able to lift a regular-sized watering can, so we use a smaller-sized can. The can is the same color, shape, and texture as the regular-sized one, but in a version that is the right size for a child. At Silverline Montessori School, practical life activities are an important part of our curriculum. As an Associate Member School of the American Montessori Society, we provide a high-quality and authentic Montessori education to our students. Our locations in Pearland and Towne Lake Cypress are dedicated to preparing children for future success in both education and life. 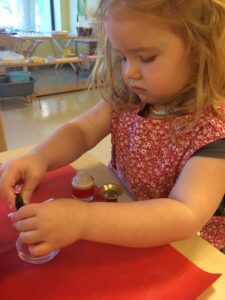 We strive to be a top tier Montessori preschool, exceeding the expectations that parents may have when seeking a preschool or daycare for their child.